It's almost time to gather the family around the Thanksgiving table again! During this holiday season, we have our favorite way to cook turkey and the perfect side dishes. But once in awhile, I like to add a new dish to our family table. Perhaps you'd like to add something new to your Thanksgiving meal as well. This stuffing recipe for Cranberry Raisin Bread Stuffing is the perfect new addition to your table. It's just different enough from the regular stuffing recipes to stand out as something new. But it still has those flavors that we all associate with a great turkey side dish - celery and sage and those other ingredients that are familiar to us. And it's easy! It's a great way to change things up a bit - and for us, it's become a yearly staple! It's just different enough from the "normal" stuffing recipes but it still has the basic comfort-food flavors that we love about the holidays. This is a fabulous side dish for your Thanksgiving table. 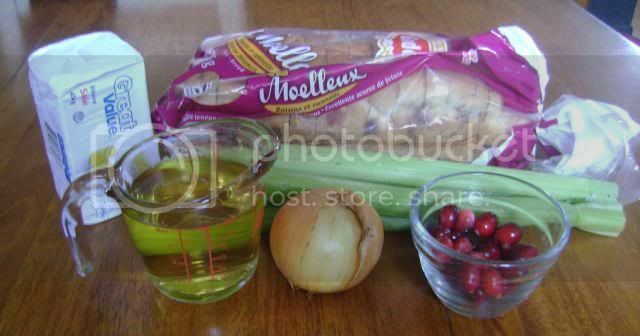 It requires just some basic ingredients that you'd find in any stuffing recipe - butter, an onion, celery, some basic seasonings. Instead of your 'regular' bread or cornbread, you'll be using some cinnamon raisin bread, sweetening it up with apple juice instead of stock and adding in some fresh cranberries for a bit of zing. So, it's still a basic easy side dish for your meal - but kicked up a notch! The first step is to soften up the celery and onions. While those are cooking (in butter, of course! 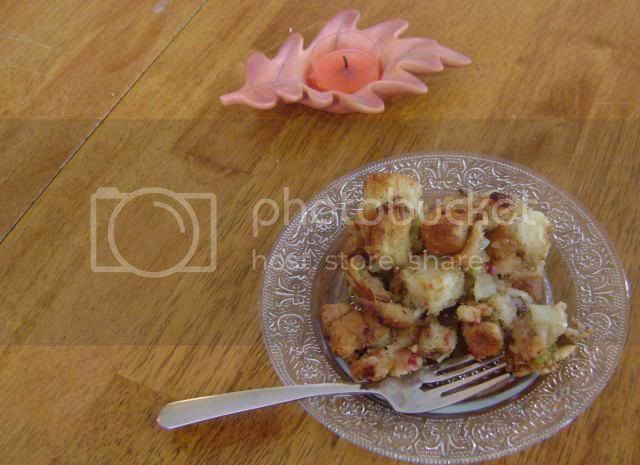 ), get the bread cut into cubes. Add the softened vegetables, seasonings, and some chopped cranberries (sweetened with a bit of sugar). Moisten with some apple juice before putting the mixture into a greased 9x13 pan. Bake in the oven at 350 for 30 minutes or until the top is lightly browned. As you can see, it's still a basic stuffing recipe with onion, celery, and sage. But by using cinnamon raisin bread and adding some cranberries it takes it up a notch. 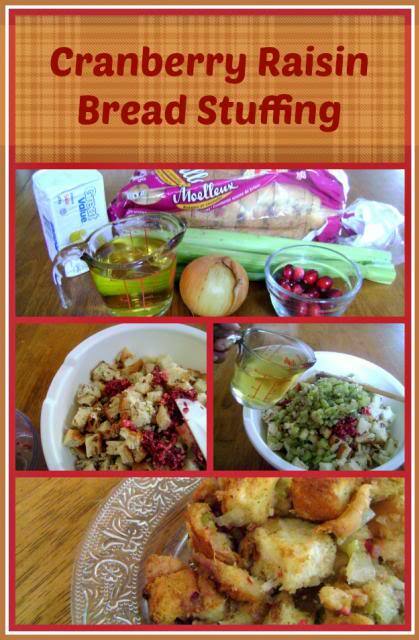 Add Cranberry Raisin Bread Stuffing to your family table (and easy meal ideas recipe box) - you won't be disappointed! Melt butter in large skillet over medium heat. Cook onion and celery about 7 minutes or until soft, stirring occasionally. Stir in the sage, salt, and pepper. Prepare cranberries and cube bread while it cooks. Place cranberries and sugar in a food processor. Pulse until finely chopped. Cube bread (should make about 10 cups) and place in large bowl. Add onion mixture and cranberries and stir to combine. Pour apple juice over the top and mix to moisten all the bread. Place in a buttered 13x9 inch baking dish; bake, uncovered, 30 minutes or until lightly browned on top.